Let's Do It for ME! : Sit for ME! "Now that I've got a dog-shaped hole in my house since I lost my sheltie in 2009, I often dogsit by looking after friends' dogs while they are on hols or courses etc. This little lass's owners, ex-colleagues of mine, have decided that cos I'm saving them kennel fees, they will donate to Invest in ME for each time I look after her! She's already booked in here quite a few times over the coming year. I love all dogs so this is a win-win situation, even on some of my worst crashed days. "Luckily, most of the dogs I usually look after are old, so a run sniffing round my long back garden chasing toys is all the exercise they want these days. 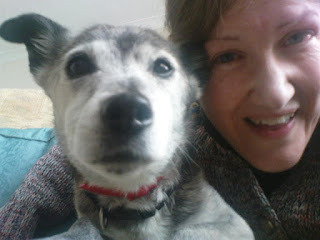 Occasionally, I've looked after younger dogs and then my mum stays over to help, walk etc. I know that frustration of being too sick to go far, or go out at all. With my own dog, I used to get round the corner to the local woods on good days and I was also blessed that some of the friends I now dogsit for also returned the favour on my immobile days." What a great idea for those too ill to care full-time for a dog of their own, and what a thoughtful gesture by Joyce's friends, who can add 25% to their donation at no extra cost with Gift Aid. If you're thinking the name sounds familiar, Joyce and her sponsors also generously donated her 50th birthday gifts to Invest in ME in October, raising over £900 towards the biomedical research planned at the UK Centre - see Joyce's 50th Birthday Gift for ME! Many thanks to Joyce and her supporters and a tickle behind the ear for all her 4-legged friends! 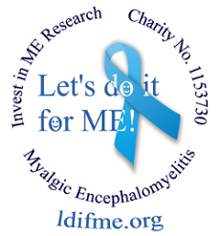 You can print off the campaign leaflet to show friends what your raising funds for. Together, we can do this - Let's do it for ME!